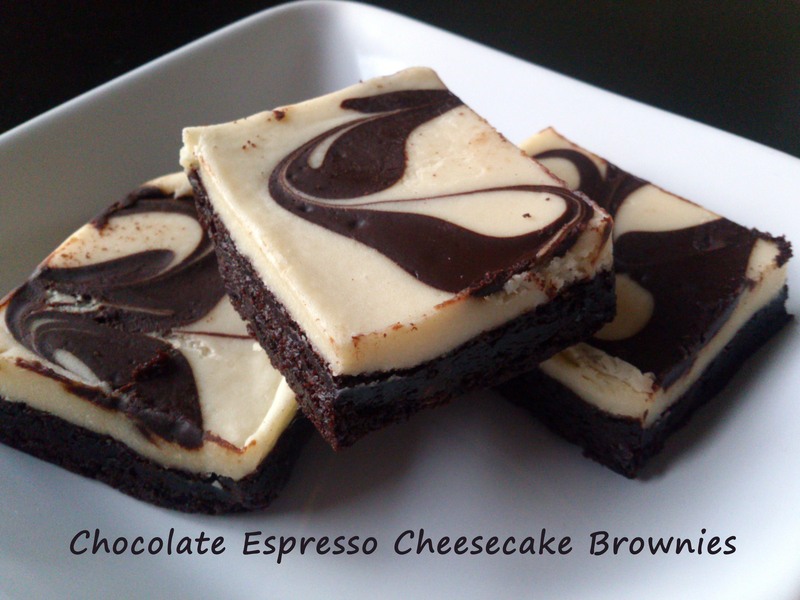 Chocolate + Espresso + Cheesecake +Brownie = LOVE! What is not to love? I love chocolate… I love coffee and I love cheesecake. Combine them into a brownie and it was instant attraction! So much so that I got bit by the baking bug as soon as I came across this recipe while sipping a latte in the big comfy chair at my favorite coffee place. Preheat the oven to 350 F, with a rack in the center. Butter a 9″ square baking pan placed on a baking sheet and set aside. Whisk together the first three ingredients. Put the butter and chocolate over a double boiler with water simmering. Stir until the ingredients melt, but don’t overheat so that the butter separates. Remove the top of the double boiler and set aside. Stir the sugar into the chocolate mixture with a whisk, then add the eggs one at a time. Beat well after each egg, then beat in the vanilla. Next, gently stir in the dry ingredients until they disappear. Set aside. Allow the espresso to cool to tepid. With a stand mixer fitted with the paddle, beat the cream cheese on medium until it’s completely smooth. Add the sugar and continue to beat for 3 minutes more. Beat in the vanilla and espresso before adding the eggs one at a time. Beat for 1 minute after each egg, then reduce the speed to low and add the sour cream, then the flour. The batter should be smooth. Pour about 3/4 of the brownie mixture into the prepared pan. Smooth it out, then pour the cheesecake layer over the top, taking care to make it even. 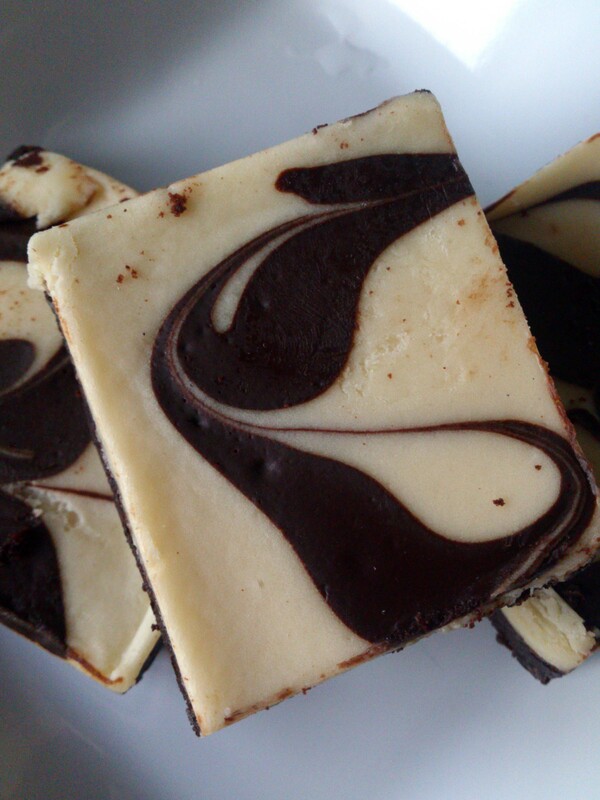 Place spoonfuls of the rest of the brownie batter on top, and use a knife to swirl the dark and light batters together. Be careful, however, not to plunge the knife into the base brownie layer. Bake for about 30 minutes. The brownies should come away from the sides of the pan. The cheesecake will puff and turn lightly browned around the edges. Transfer the pan to a wrack to cool. Once it reaches room temperature, refrigerate for at least 2 hours, until well chilled. Those ones in the photo you did not make. Those are from Starbucks.